This week on Vinaya Speaks with Tsultrim Pawo, Tsultrim talks with Takseng who speaks about his experience living as a monastic at Gampo Abbey, the schedule and the diet. *The views & opinions expressed in this interview are that of the persons speaking and are not directly endorsed by Gampo Abbey. 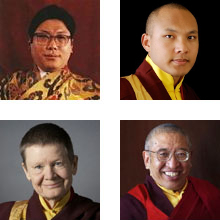 Gampo Abbey podcasts are not formal dharma talks, but rather conversations between some of the life ordained monastics and those that are here temporarily for the 2016 Lion Year. We hope that these conversations cover some of the things that anyone who is interested in coming to the Abbey might be curious about. That’s who the podcast is geared towards.